What do cereal boxes, soup cans, cardboard, LEGO, and an old picture frame have in common? We can used them to tidy up our desktops by turning them into desktop organizers. Check out these 7 projects (plus a bonus at the end!) for the how-tos and to get inspired. Amy used cereal boxes and toilet paper and paper towel rolls to make her organizer. Ilda used cans and duct tape to make her wild leopard organizer. Grr. 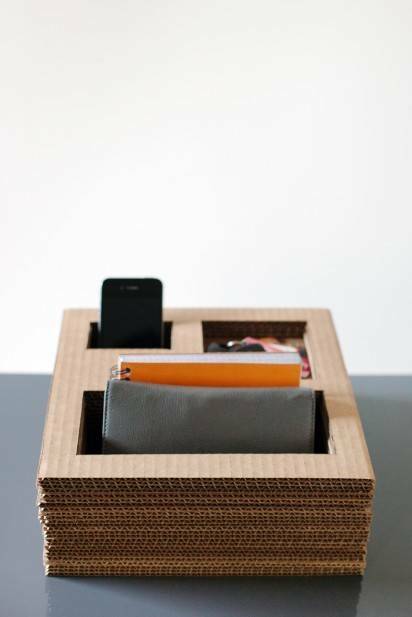 For something a lot more minimal, this cardboard organizer will do just fine. Home Depot shows us how to use pre-made wood corbels (or brackets) to make desktop/bookshelf organizers. No instructions for this LEGO desk organizer, but, hey, any self-respecting LEGO fan should be able to replicate it easy enough. And, finally, my favorite (because I haven't seen it done before), a table-top picture frame turned handy-holder. BONUS: Just HAD to add this project Capree recently found and posted here on Curbly, inspired by an Anthropologie offering.